I have been subscribing to Vegetarian Times for almost two years now and, sadly, have yet to make a single recipe from any issue. That is, until tonight. I’ve been saving my soon-to-spoil herbs, stalks, peels and more for a few weeks and decided it was time to make some veggie broth — if for no other reason than the refrigerator at the new house is teeny so it was fighting veggie burgers and ice cube trays for space. 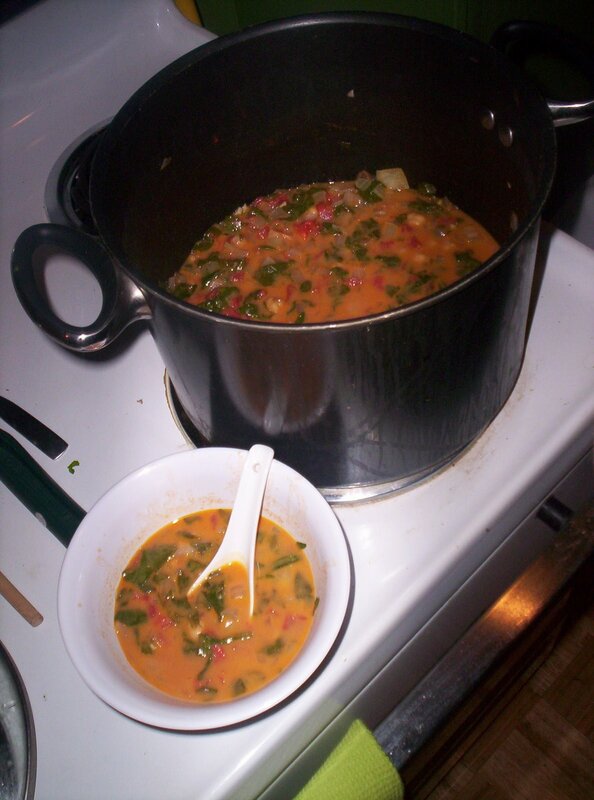 Out of three contenders I was deciding between, I realized I had 95 percent of the ingredients for the African Chickpea and Spinach Soup from the March 2007 issue so that’s what won. That and the fact that it sounded goooood. I just finished making it and — holy cow — did I choose wisely. A brief taste test is all I have experienced, but it’s really good. In a way that’s a little unexpected. One of those recipes that just works, but you can’t figure out what your favorite part is. It almost doesn’t make sense, but that’s OK — it’s delicious nonsense. 1. Heat oil in large pot over medium heat. Add onion and saute 5 minutes, or until soft and golden. Add garlic and cook 2-3 minutes more, or until garlic is lightly browned. 2. Blend peanut butter and 1/2 c. broth in food processor to make smooth paste. (Note: I don’t see how this could be a paste. Maybe with natural peanut butter? It made peanut butter liquid for me, which seems to have turned out fine. Maybe it’s because I just used a whisk instead of putting it in a food processor.) Blend in remaining 1 1/2 c. of broth. 3. Add paprika, coriander and cayenne into onion mixture and saute about 1 minute, until fragrant. Stir in peanut butter mixture, chickpeas and tomatoes. 4. Simmer 5 minutes. Season with salt and pepper. Stir in spinach just before serving. (Although I don’t intend to eat it until tomorrow, I chopped up about 1/2 a bag of spinach and added it. I’m guessing it will hold up just fine until tomorrow). Entry filed under: Uncategorized. Tags: Recipes, soups, vegan, vegetarian. Guest Post: Chilaquiles	Oh, no!